Do you know who controls your food? 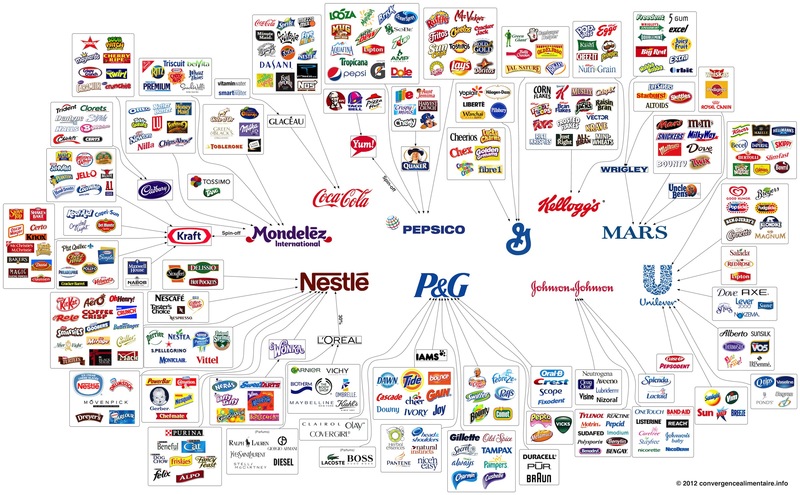 Joki, a University of Montreal student, compiled the above graph which shows that Pepisco, Nestle, and Kraft control the lion share. (See here to view a larger picture.) Joki’s research paints a soap opera full of villains and scandal. In reality, we control our food destiny. Here are some easy ideas on how to kick the box top habit and reign in control. Be sure to add your ideas in the comments. Reigning in the Box Tops. Double your recipes so you can eat one meal and freeze the other for another day. Consider prepping for two different meals. Instead of browning a pound of meat, brown 2 lbs and freeze the balance. Start shopping at your local farmer’s market to source fresh fruits and vegetables. Many times, you will also find organic grass fed beef, locally made cheese and milk. Consider growing your own vegetables. (Be sure to check out how to grow your own seedlings.) Container growing is easy if you don’t have room for a garden. (For expert advice, check out Mike’s site, the Urban Organic Gardener.) I use potato bags from Gardeners’ Supply to grow beets, peppers, and potatoes. Consider growing tomatoes in them as well. Make your own broth from your leftover peels or meat/chicken bones. So easy, especially if you use your crock pot. (Check out my chicken or vegetable broth recipes) Ditch the plastic lined aesthetic containers and/or the added unhealthy MSG laden broths. What are your favorite food hacks so you can ditch the store bought packages? What is your favorite on the run home cooked recipe? Do you garden? If so, what are your favorite veggies to grow? Have you decreased your store bought package consumption lately? If so, what have you stopped buying and why? What are your thoughts about Kraft, Pepsico, and Nestle? Thanks to Mary at In Women We Trust for the tip. I have my own organic garden. I plant lettuce and tomatoes and make healthy organic vegetable salads. Unfortunately, I am NOT a gardener. I have tried for several years and just don’t have the passion. I love the idea of going out to the garden to pick fresh veggies, but I do not like tending to the garden. That said, I stick to my local farmers market when possible and organic options (when I can) at the grocery store, or buy lower pesticide “clean 15” items.